Bangkok (Thailand) – May 11, 2018 (travelindex.com) – Amara Bangkok has been awarded the prestigious MICE Venue Standard Certificate 2018 by Thailand Convention & Exhibition Bureau (TCEB) for its outstanding meeting facilities that meet internationally recognised standards, making it one of Thailand’s leading MICE venues. 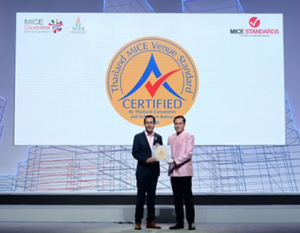 Thailand Convention & Exhibition Bureau (TCEB) initiated the Thailand MICE Venue Standard (TMVS) in 2013 to develop Thailand’s meetings and exhibitions venues. Due to its nationwide success, it is used as a framework adopted by other ASEAN nations in developing a common standard across the region. ‘We are proud that our four dedicated meeting rooms have been officially recognised among the best in Thailand MICE industry. Receiving this MICE Venue Standard Certificate not only demonstrates the strength of our competent events team, top-of-the-class meeting facilities and our ability to successfully accommodate the different needs of MICE groups, it also serves as a guarantee to all event organisers who are seeking to create meaningful and rewarding corporate events in Bangkok that Amara Bangkok is an accredited MICE option in the heart of Bangkok’ said Viranat Silananda, General Manager, Amara Bangkok. Strategically located in the bustling Silom district, Amara Bangkok offers 250 tastefully appointed guestrooms designed for the discerning traveller, with contemporary furnishings in soothing tones, boasting modern conveniences including luxurious bathrooms featuring rain showers and premium bath amenities. Thai art pieces feature in every guest room and hotel public spaces, creating that local connection in a contemporary space. The hotel offers innovative dining concepts, including signature Singaporean and authentic Thai cuisine at all-day restaurant Element, fashionable rooftop nightspot AkaAza which offers spectacular views, signature cocktails at The Bar and specialty coffee at Barista, as well as the Minibar Boutique for guests’ convenience. The sky gym and sky pool allow guests to reenergise after a busy day and offer magnificent city views. Amara Bangkok provides state of the art meeting and event facilities including the Grand Ballroom Tanjong Pagar 1 and 2, named after the neighbourhood where Amara Singapore, the Group’s flagship property is located, and two function rooms Surawong 1 and Surawong 2. An Executive Club Lounge has also been designed with the business travellers in mind. Amara Bangkok is an exciting 250-room lifestyle hotel for both business and leisure travellers. The hotel offers spectacular views of the Bangkok skyline. Located on Surawong Road, parallel to the main Silom and Sathon roads, Amara Bangkok is a stone’s throw away from the city’s main financial hubs. Nestled in the centre of the historic Bangrak district, travellers can find a host of restaurants, world-class bars and the colourful Patpong Night Market at our doorstep. Select from a wide range of well-appointed guestrooms to suit your needs and preferences – be it a Cabana Room with exclusive access to Jacuzzi on Level 9, Deluxe Room, Executive Room and Club Room. Each guestroom features contemporary and modern furnishings with soothing tones. For additional comfort and extensive amenities and services, opt for our Club Rooms with exclusive access to our Club Lounge on Level 20. Element, the 145 seater hotel’s all day dining restaurant, features indoor dining and refreshing al fresco dining area. Guests can unwind at the rooftop sky pool, AkaAza and a fully-equipped gym.